I’ve been listening to a podcast called the Yaminade. It’s about Yammer (yes, a podcast just about Yammer :), but the content is relevant to anyone who manages an internal social network/social collaboration platform. In the latest episode (14) the host Paul Woods interviewed the Yammer lady, Melanie Hohertz, who is the de facto chief community manager at Cargill (Cargill, by the way, is the largest privately owned company in the US in case you didn’t know). I listened to the podcast the other day and jotted down couple of notes (I take no responsibility of the accuracy of my notes – you need to listen to the episode yourself if you want accuracy..). Hope you find them useful! (My comments in italics). In case you’re interested I interviewed Melanie a year and a half ago and turned it into a case study. Cargill have been using Yammer since 2012, and they have currently about 24,000-25,000 users (Cargill have over 140,000 152, 000 employees). There were teams that had asked for social collaboration for years. Interesting factoid: Cargill actually killed Yammer after one year, but then relaunched. 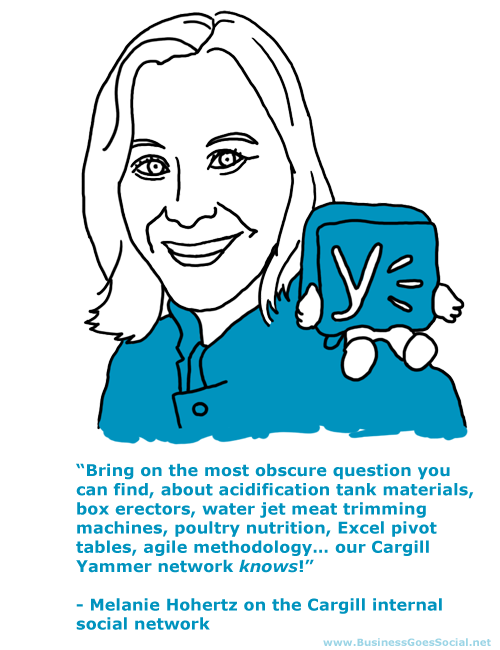 The event that really got Yammer off the ground at Cargill was Cargill’s annual (?) leadership forum. It used to be a closed door event but Yammer turned it into something anyone at Cargill could follow. This reminds me of a story from another organisation where a leadership event accidentally kickstarted Yammer (Yammer was supposed to be a temporary channel for the participants, but it spread to the rest of the organisation. That turned out to be one lucky accident as they seem to be pretty good at social collaboration these days). They didn’t introduce Yammer to the whole organisation right away. They followed the soft launch approach for about 6 months(?) and even with soft launches and support 1/4 Yammer use cases/initiatives died. The soft launch approach was important because by the time everybody else started to join the network, there was already activity there (no-one wants to join a ghost town). Help materials were important. Melanie provided coaching and created help materials as Yammer didn’t really provide very good help content. Yammer has become an integral part of town hall events. And Q&As. People have now started to weave it into processes as well. Melanie mentioned an interesting example from the Cargill chicken feed business (involves using mobile phones and doing research). Recent use case: Cargill have been outsourcing their IT, so they’ve been using Yammer (especially “Yam Jams” i.e. online Q&As) to communicate this and address issues. Melanie has also implemented an interesting employee engagement campaign where they’ve asked staff to post selfies with a cardboard cutout of the founder of the company on Yammer and tell why they are proud to work at Cargill. This has been a very successful campaign. Sounds fun! As Melanie is a bit further down the adoption curve her power users are running their own YamJams and don’t really need that much coaching anymore. If you are going to launch an enterprise social network, you need someone to mind the store. Invest in someone who is dedicated or nearly dedicated. There has to be a channel owner, somebody who cares. Yammer was killed after one year at Cargill partly because there was no-one to defend it. (The second time around IT stepped up and owned it – in practice they funded it, but then stepped back and let Melanie and co do their thing). She would also really beat the drum for public groups, now she has way too many private groups that prevent “ambient awareness” – one of the key benefits of using Yammer in the first place. Group set up check-list is super important: what do you want to get done in this group, what do you want to achieve, who are the champions for the first weeks, what are the early activities (introductions , leadership availability) etc. She should have regarded metrics not just as a way to justify Yammer (“look how useful it is and the numbers prove it” – type of stuff), but as a community management and development tool (to recruit new change agents etc). Talking of metrics. Melanie has always been a vocal critic of the poor analytics tools that come with Yammer. Melanie had good news to those who lament the “vanity metrics approach” Yammer has taken with analytics: there is a new analytics tool aimed at Yammer community managers called Tygraph – I haven’t used it myself, but I’m sure it’s a big, big improvement from the basic Yammer metrics! PS. I interviewed Melanie some time ago for my book Internal Social Networks The Smart Way. You can download the Cargill Yammer case study (PDF) here.